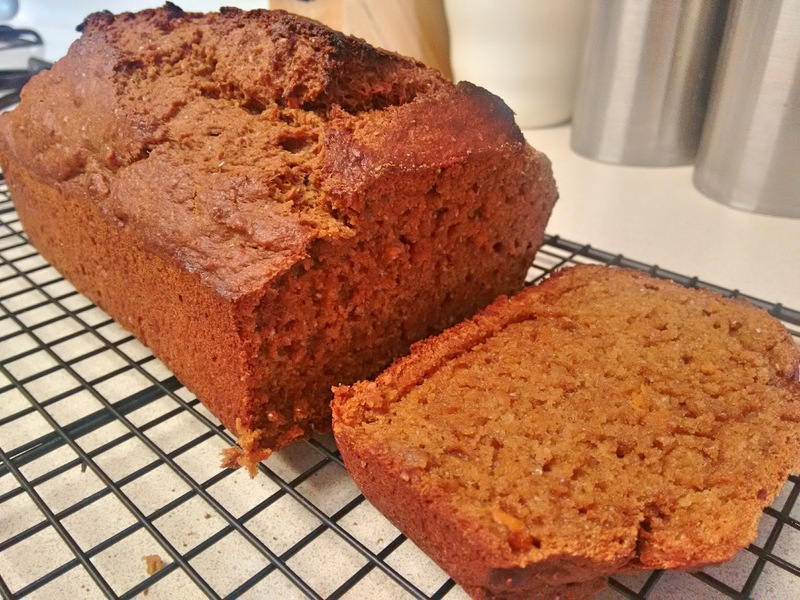 My boyfriend raved about a gingerbread loaf he ate in Seattle last week. I decided to make a healthier version by using whole wheat flour and sweet potato. Which was clearly a success when he looked at it funny and said, "Are there supposed to be stringy things in this?" The sweet potato adds natural sweetness, so it could be replaced with 1 cup of unsweetened applesauce in this recipe. After I put the loaf in the oven, I realized that I had forgotten to add the salt. I couldn't figure out why the sweetness wasn't "popping" when I tasted the batter! Preheat oven to 350°F. Grease a loaf pan with canola spray. Poke holes in the sweet potato, then microwave on high for 10 minutes. Place potato on a cooling rack, and slice open to allow to cool inside. Cool for at least 25 to 30 minutes. Combine flour, salt, baking soda, baking powder and spices in a large bowl and mix until uniform. In a second bowl, combine molasses, maple syrup, coconut oil and hot water. Whisk together. Mash the sweet potato and add to the bowl. Add eggs and whisk again. Pour wet ingredients into dry. Mix to combine, then transfer to loaf pan. Bake for approximately 60 minutes, or until a toothpick comes out clean.